Early nineteenth century Carlisle - a city suffering indescribable poverty; a desperate, starving population, many housed in insanitary sparsely furnished slums, deprived of the necessities of life and dependant upon charitable donations of food and clothing; a population swelled by a mass influx of Irish immigrants who had left their own impoverished land for a better way of life; wholesale unemployent mainly brought about by the mechanisation of the weaving industry, but often exacerbated by harsh weather conditions that prevented outdoor work for weeks on end. Crime was rife, much of it minor by today's standards, but intolerable nevertheless at the time; the west end of the town, the 'FREE CITY' a no go area for other than residents. Annual (almost) general elections in a city with two members of Parliament but with few citizens enjoying the franchise; electioneering frequently creating great excitement and anger with unruly demonstrations by citizens demanding improved living conditions; rioting, killing of innocent bystanders and consequent debate in Westminster. A city, a country even, without police. Intervention by Home Secretary Robert Peel and, in 1827, the birth of a permanent, professional city police force, one of the first in the United Kingdom, when 'twenty-one stout men' under the command of a superintendent and supported by an Act of Parliament were sworn in as constables to set about the task of restoring and maintaining law and order. 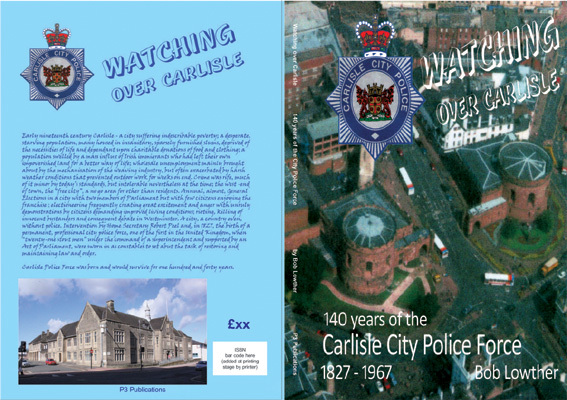 Carlisle Police Force was born and would survive for one hundred and forty years. Price in UK £8 Online order: post and packing £4.